The Art Of... Stop-Motion Animation | The Art Of | Kids VT - small people, big ideas! What could be cooler than bringing your LEGO men to life? Molding out of clay a two-headed beast who tears down a building, perhaps? Or commanding a banana to peel itself? With stop-motion animation, all of this is possible. So what exactly is stop-motion animation? Kids might know it from the 2009 film the Fantastic Mr. Fox or the Wallace and Gromit movies. 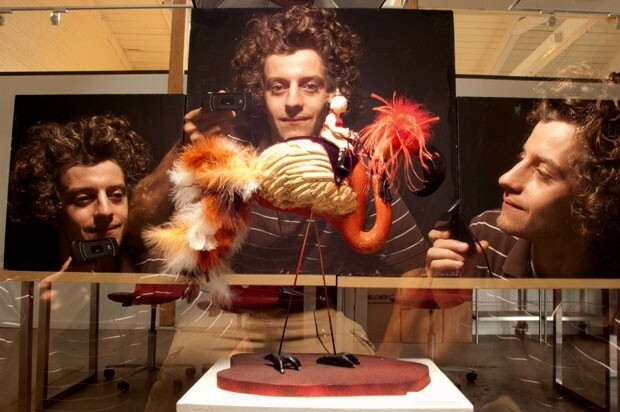 "In general," explains Nicholas Heilig, a 28-year-old Burlington artist who's teaching a stop-motion animation class at the Davis Studio this fall, "it's just manipulating a physical object to make it look like it's moving." In his classes, kids use toys, clay and even their own bodies as subjects. It used to be that you needed expensive equipment or complicated VHS camera setups to make a stop-motion animation. These days, all you need is a computer, a camera and editing software. "Computers have really allowed kids to do crazy, amazing stuff that they couldn't do before," says Heilig. Stop-motion movies are made by shooting individual pictures with a camera or webcam, of subjects that have been moved slightly between each shot. Threading the stills together using editing software creates the illusion that the inanimate objects are moving. Classes begin with a storyboard. Heilig teams students up in small groups, each of which comes up with a story. There's only time to turn one of the narratives into film per group, so "they learn how to compromise," says Heilig. "Getting started, making the characters, is the easiest part," he says. "The kids have so much creativity." From there, the team divides up the labor: One person handles the clay or toys, another takes charge of the camera and computer, and a third directs. There's a lot to learn when making a movie. In addition to filmmaking basics — including staging entrances and exits, cutting scenes, and creating an overall feeling with music — kids learn basic laws of physics, too. They're disguised in fun-sounding terms, such as "squishing and squashing," which refers, in clay animation, to the effect gravity has on certain objects. "Let's say you have a character bouncing a basketball," says Heilig. "Every time the ball hits the ground, it's going to squash a little bit." The greater goal, of course, is defying gravity — or at least making it look as if you are. Turning the camera on themselves, for example, kids can make it look as if they're flying. "You have a person moving across the screen, and every time you take a shot you have them jump in the air," explains Heilig. Kids learn the art of visual storytelling, which includes logical sequencing. You wouldn't want to bump the camera, for example, unless an earthquake is the intended effect. With all of the possibilities, Heilig's biggest challenge is convincing the kids to slow the action down. Each second of an animated film is made up of 30 still frames. "They need to think about moving as slowly as they can with their characters," he says. Still, it's not as tedious as hand-drawn animation — and thanks to the computer, you can play back what you've done at any point. Heilig says it's great for kids because "they can really focus on creating an idea, a storyline. They can really express themselves ... And they can start to see a product right away." "The Art of..." spotlights creative skills that enrich kids' lives. Got a class or teacher to recommend? Email us at ideas@kidsvt.com. Megan James is a staff writer at Seven Days. COMPUTER: Most kids have access to a computer, either at home, school or a local library. WEBCAM: Available online for as little as $20. EDITING SOFTWARE: Heilig uses a Mac program called iStopMotion ($49) in conjunction with GarageBand, which comes with most Macs, to mix music. For a PC, he suggests Stop Motion Pro and Audacity. THE CLASS: Stop-Motion Animation, ages 9-14, Davis Studio, Burlington. Six-week class: Fridays, October 7 through November 11, 3:30 to 5:30 p.m. $200. Info, 425-2700, davisstudiovt.com.